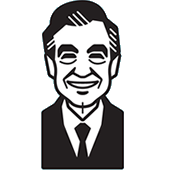 Mister Rogers has borrowed some basic magic tricks from his friend Charlie Appel. After demonstrating two tricks, he reveals the secrets behind the magic. Taking out a third trick, Mister Rogers sings the directions and finds a kiss inside a small box. Mr. Appel stops by and marvels Mister Rogers by performing some tricks in the kitchen. He explains that mastering more difficult tricks takes practice. In the Neighborhood of Make-Believe, Digger Digorum is returning to a dig in Australia and would like to take the magic kite with her. The kite responds with a note: "I cannot go away. I am a make-believe kite." Since the make-believe kite must stay in Make-Believe, Corney gives Digger Digorum a photograph of the kite to take with her. As she prepares to leave and say goodbye to the others, Digger Digorum sings I Am a Digger. Assuming King Friday would want to claim possession of the kite, Lady Aberlin suggests that she will take it to the castle. The others in the Neighborhood disagree and cannot decide who should keep the magic kite. The kite delivers another message solving the problem: "Take turns." Back at the house, Mister Rogers talks about magic tricks and explains that they are not real. One trick performed by Mr. Appel involves him pulling a rabbit from his hat. 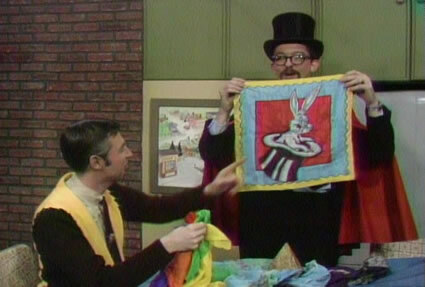 The rabbit is a scarf with the image of Bugs Bunny. Corney reveals that the "left diode" on the front of his factory is actually a camera that "takes pictures of unidentified flying objects that come near the factory. Mr. Appel appears in later episodes of Mister Rogers' Neighborhood including Episode 1216.